Many people have called the dawn of the smartphone the death of manners and conversation. Some people are often too busy checking their phones to mind their manners. While it's not really a huge deal, Hong Kong's Ta Kung Newspaper says otherwise. 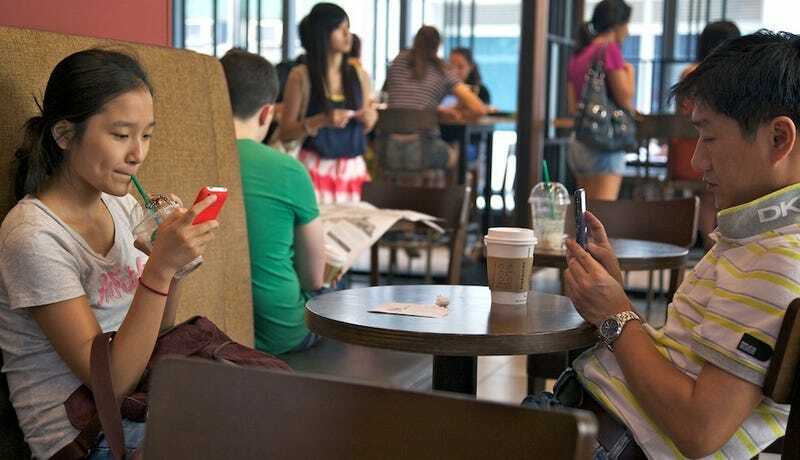 Ta Kung Pao, a Beijing backed Hong Kong based newspaper, put out a report by the Hong Kong Research Association that says HK residents are addicted to their smartphones. The HKRA found that 53 percent the 1,100 people sampled were afraid of being separated from their smartphone. These same 53 percent said that they become anxious when they leave their smartphones at home and they suffer from...phone withdrawal! So what exactly on the smartphone is captivating the Hong Kong people? According to Ta Kung and the HKRA, it's a mix of video games and messaging. HKRA says that of the people surveyed, 80 percent said they played up to an hour of video games a day on their smartphones. Unfortunately they didn't pick out any specific games in their report, but the HKRA did point the finger at free online messaging app, What's App. The study was quick to point out the issues with smartphone dependence. The director of the study, Mak Yin Wei told Ta Kung that it's not good for the public to over indulge on smartphones because it can create issues with personal communications. While Ta Kung is a state backed paper and everything it publishes should be taken with a grain of salt (that and because of the survey sample size), there might be something in what the director of the study says. It's awfully frustrating to goto a restaurant with a group only to sit their silently the whole meal because everyone's got their head down.